FirstBuild is a creation of GE Appliances. They established an open community with access to world-class engineering and design talent for exploring ideas and creating home appliances. Why a prototype is worth a thousand meetings. Below is a summary of the topics discussed followed by a link to the interview. How did FirstBuild start? Eric Ries was a consultant to the GE executive team. This resulted in an initiative called Fast Works. It was an experiment to try lean startup principles at GE. Essentially an internal VC panel was created where employees could pitch ideas and seek sponsorship from a senior leader. Several good things came out of that program, but we also recognized that many barriers were still in place hampering innovation. After asking questions how to create an environment that could operate more like a start up, FirstBuild was born. The result was an open innovation business separate from GE. We created an online community where members could share ideas, participate in challenges, and collaborate. We also created a maker space that anyone from the local community can use. They can bring ideas and make something new. The combination of these approaches infuse FirstBuild with a great deal of entrepreneurial spirit as well as providing access to world-class engineers and creative minds. Where do product ideas come from? A great example to talk about is Opal, our nugget ice maker. GE already had nugget ice technology. The team that developed it was trying to find a way to get it into a GE refrigerator. I was aware of this effort. We also saw part of our online community discussing nugget ice. Putting the two together was pretty straightforward, leading to the concept of a countertop nugget ice maker. 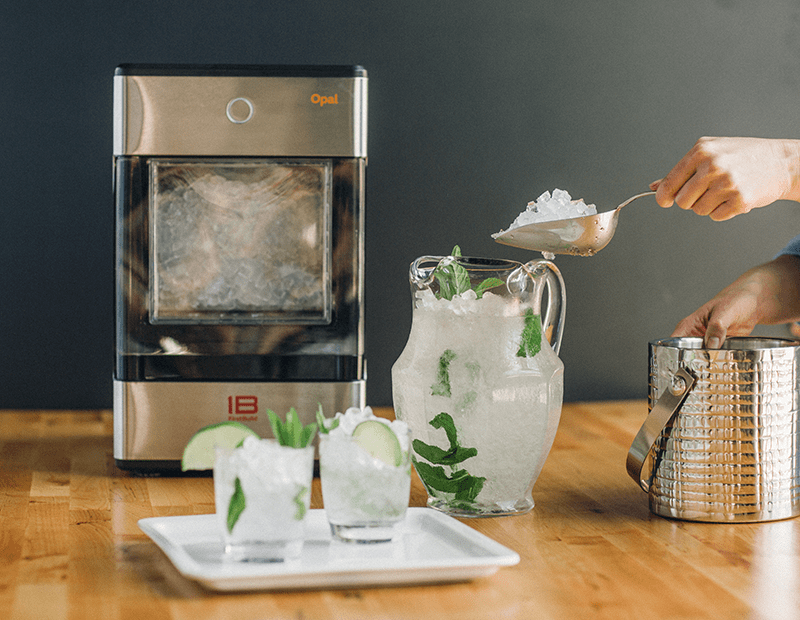 We shared some specifics with the online community – a countertop unit that would hold 3 pounds of ice, make a 1 pound of ice an hour and cost $500. For the nugget ice enthusiasts, this was an appealing product concept. Often our product ideas come from the seemingly random intersection of technology we have access to and what happens in our maker space and online community. Serendipity is at work. How do you use design challenges? When we encounter a problem, we can create a challenge in our online community. We try to give the most basic possible specification and frame the problem in a very general way. The great thing about design challenges is we will receive so many completely different concepts. It gives us the opportunity to choose what’s going to be the core that the product is built around. We usually provide a specific monetary incentive for winning a design challenge. If we plan to use a crowdfunding campaign for the product, we sometimes offer a percentage of the campaign to the challenge winner. How do you prepare for launch? The great thing about us is that we operate on a minimum viable product basis. We don’t need to go all the way through the development process to launch a product. Instead, we often pre-launch before full development. Indiegogo, a crowdfunding platform, is one place we can do that fairly easily. So instead of putting together an entirely new product introduction process, we put together a marketing campaign and a viable prototype of the product. We launch the product for presale on Indiegogo. We are launching about 12 products a year. What is FirstBuild learning? Every time we launch a product, we do something that we had not done before at FirstBuild. Consequently, we are learning from every launch. Every time we launch, we get better at our core business but we also learn something new. When we launched our Paragon Induction Cooktop, we were a corporation figuring out how to do a crowdfunding campaign. For Opal Nugget Ice, we explored using Facebook ads for the first time. It worked out well, leading to a very high SEO rating for our website without spending a lot on advertisements. Listen to the interview with Taylor on The Everyday Innovator Podcast for product managers and innovators.